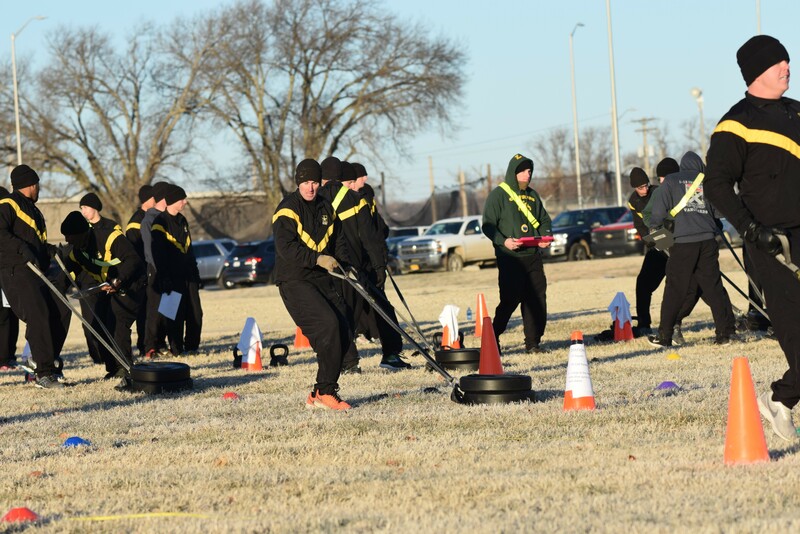 FORT RILEY, Kan. -- The implementation of the Army Combat Fitness Test - a way to better connect fitness with combat readiness for all Soldiers - is in the field test stage. Master Fitness Trainers are learning what the new test entails and how to grade it. 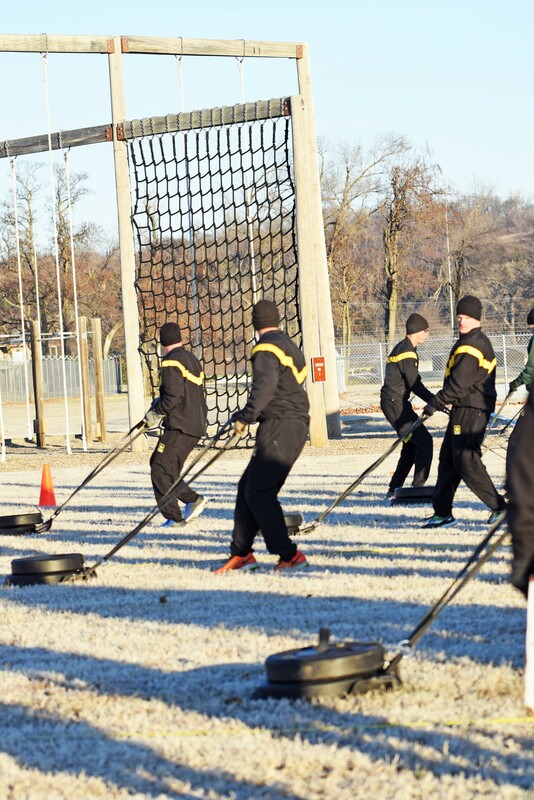 A mobile training team from Fort Jackson, South Carolina, came to Fort Riley Dec. 10 through 13 to teach Soldiers how to conduct the ACFT at their units. "They're training certain noncommissioned officers who can then go and train further people so we can continue to conduct this as people move on," said 1st Lt. Jason Beauregard, task force engineer and head of the Soldier Readiness Test and Training Program at the 1st Combined Arms Battalion, 18th Infantry Regiment, 2nd Armored Brigade Combat Team, 1st Infantry Division. - He said while there were Soldiers from all units on Fort Riley at the training, most of them were from the 1st Combined Arms Battalion, 18th Infantry Regiment, 2nd ABCT , 1st Infantry Division, and the 97th Military Police Battalion. 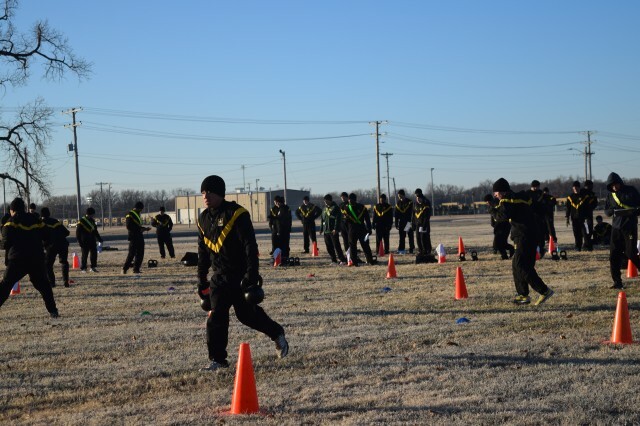 They are two of the 62 battalions across the Army chosen to participate in the testing. Capt. R.J. Carbone, ACFT Team Five leader from Fort Jackson, said on the first full day of training, his team trained the level-three trainers. "For the most part they are the Master Fitness Trainers, so they've been to the Master Fitness Course," Carbone said. "We train them on how to administer the ACFT. They receive in-depth knowledge of the ACFT -- how to set up the lanes, how to properly grade and also how to train the level twos." 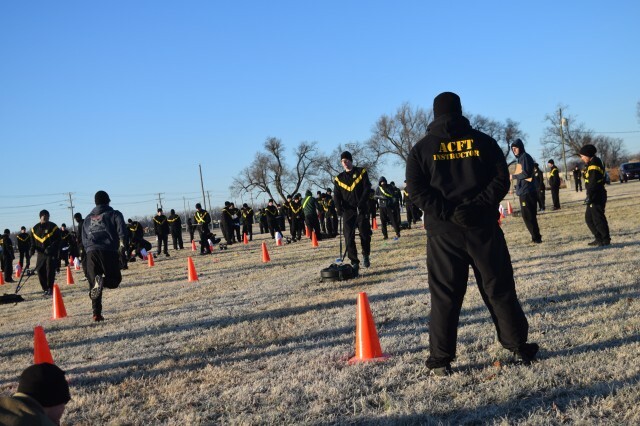 On the second day of training, the level-three trainers graded the level-two trainers while ACFT Team Five observed to make sure they were grading properly. Level-threes also gave a block of instruction to the level-twos -- again under the watchful eye of the Team Five members. On the third day the level-one trainers came in; level-two trainers graded them as they took the ACFT while the level-threes ran the test. Beauregard said the training Team Five gave was "extremely important." "It teaches the proper form as well as standardizes the grading criteria," he said. "Originally, when they were putting everything out, it was small amounts information. But now, they have the actual complete manual. Now, it's cut and dried." The training also allowed the Soldiers to do the ACFT, some for the first time, and gauge their individual ability. Beauregard said overall they had "relative success." "I think it's one of those things that you have to take it several times to really, fully understand what the best methods and practices are for it," he said. Access to the equipment needed for the test will present a challenge for individuals and units. 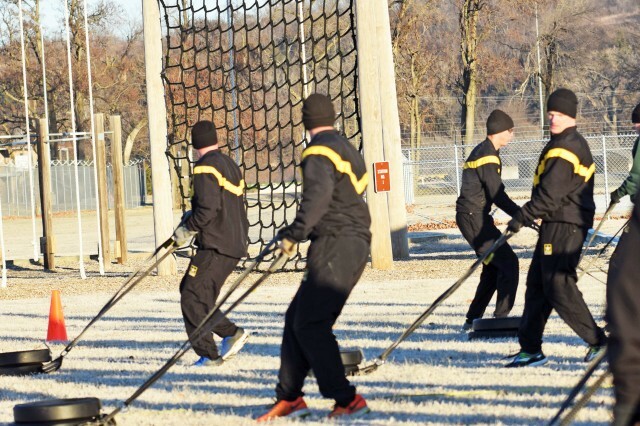 The old Army Physical Fitness Test doesn't require additional equipment. "This new PT program comes with weights and medicine balls and all that kind of stuff," Beauregard said. "That adds a whole new requirement and criteria, financial burden, as well as the supporting personnel that's going to be provided along with it,"
In addition to training Soldiers on the test, as Team Five and other training teams visit the 62 test battalions, they are also gathering data. "Some of the data -- MOS, age, gender, … what unit they came from, where they took the test, whether it was on grass or turf, all that will be compiled and reviewed," Carbone said. As it stands now, a passing score on any of the events in the ACFT is dependent on the Soldier's Military Occupation Specialty. However, Carbone said even that is subject to change. "It's still in the testing phase and that's why we're out here conducting all this," he said. "All this data that we're collecting is getting sent up to [Center for Initial Military Training] and they're the people that decipher all the information." 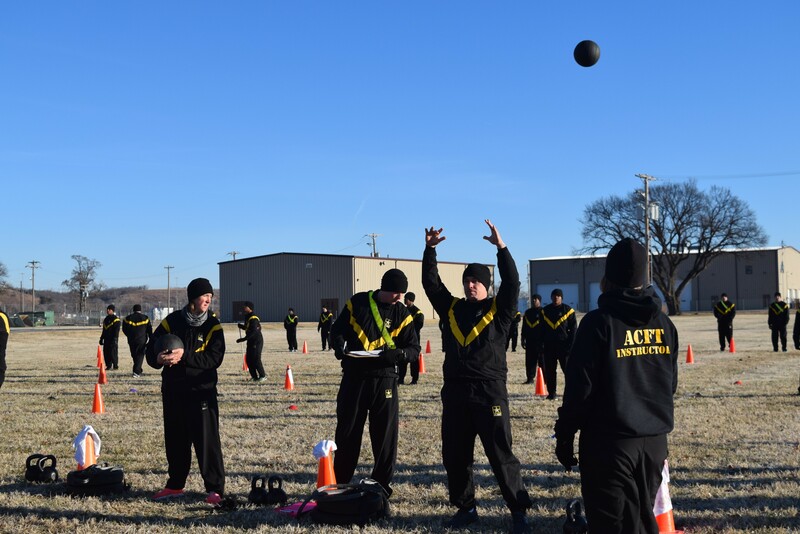 Despite the work going into changing from the Army Physical Fitness Test (APFT) to the ACFT, Carbone said it will benefit the Soldiers and the Army. "The ACFT has the ability to predict 80 percent of the Soldier's warrior tasks and battle drill performance whereas the current APFT only has the ability to predict 30 percent," he said. "That's the reason why the Army is changing their tests of record."